Apple, a delicious and crunchy fruit packed with loads of nutrients and antioxidants is the most popular choice among health and fitness lovers. Glycemic index of foods (GI) is the ranking of carbohydrates of foods based on a scale of 0 to 100 according to the extent to which they raise blood sugar levels after eating. 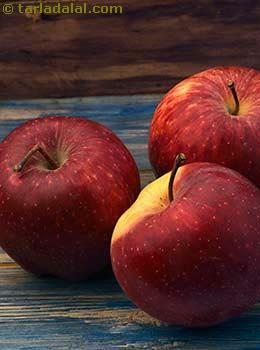 Apple is not only a low calorie fruit, but also a low glycemic index fruit. The glycemic index of apple ranges from 32 to 38 as confirmed by American Diabetes Association. This means apple does not raise your blood sugar levels instantly. However, the glycemic load (GL) is a better measure of the type of carbohydrates as compared to glycemic index. As it takes into account both the quality and quantity of carbohydrates. The glycemic load is the measure of increase in blood sugar levels after eating one serving of that particular food. The glycemic load of apple comes upto 4.7 which means it is a low GL food. Is Apple suitable for diabetics? As apple has a low Glycemic index (gi) and a low Glycemic load, it is a diabetic friendly fruit and suitable for diabetes care as it has a low effect on blood. But correct portioning of fruits is very important for diabetics, therefore they should consume only one serving (1 small apple) at a time to control blood glucose levels. Total Carbohydrate in a regular apple is 28 grams. Apple can also be combined with various other foods like low fat yoghurt or Low fat milk to reduce the overall glycemic load of the recipe. If eating apple alone seems boring, you can make it into a tasty and delicious recipe like an Apple pancake or an Apple and Oats milkshake, which will also be a good option for weight watchers. Yes, apples are absolutely great for weight loss because of it is low in calories. Since apples are also high in insoluble fiber from its peel and soluble fiber from the inside of the fruit, it will remain in the stomach for a longer period of time and the person will remain satiated.